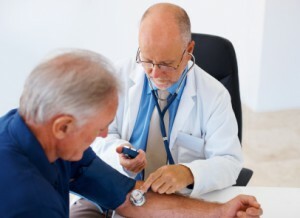 Scientific evidence suggests that environmental factors acting early in life may affect blood pressure in adult life. A study in Britain in 2004 supported earlier studies on infant nutrition and blood pressure that show a small reduction in systolic blood pressure in children breast-fed compared to those who were bottle-fed. Breast milk contains DHA which is important for growth and development of the foetal central nervous system and the retina. Breastfed babies are less likely to be overfed. Breastfeeding costs less than commercial infant formulas currently available. Breastfeeding promotes close mother and child contact. Breast feeding can also confer benefits to maternal health in later life. Studies at Pittsburgh University 2009 have found that women who breast-fed are at a lower risk than those who have not from developing high blood pressure, diabetes and cardiovascular disease decades later when they are in menopause. One possible explanation for this occurring is the hormone oxytocin. This is important for milk production and is known to also relax blood vessels, making them more flexible and possibly more resilient to plague development and narrow of arteries. There is a perceived inconvenience of breastfeeding: with respect to the commitment that breastfeeding requires as well as the difficulties encountered in establishing a feeding routine. Perceived embarrassment in others: this is a major barrier to breastfeeding as not only do women have to come to terms with their own embarrassment, but also that of others. Should you have any questions or concerns regarding infant feeding, pregnancy or lactation requirements then do contact us today. B Stewart-Knox, K Gardiner, M Wright. What is the problem with Breastfeeding? A qualitative analysis of infant feeding perceptions. Journal of Human Nutrition and Dietetics 2003; 16(4): 256-275. I believe that you must write more on this matter Infant nutrition influences blood pressure later in life – Articles – Lea Stening Health. It won’t be a taboo topic but typically people are not sufficient to speak on such topics. Hello there, simply become alert to your weblog via Google, and found that it’s truly informative. I’m gonna be careful for brussels. I will be grateful if you continue this in future. Lots of people might be benefited out of your writing. Cheers! Thanks, I’m glad you’ve found it informative. You’ve made some really great points in this article that I feel make readers think. This is unique content loaded with great information. Thank you.